Robert Palmer knows how uncomfortable it can feel to be a black professor at a predominantly white college. He recalls speaking with a white student he was advising at public Binghamton University in upstate New York, where just 4 percent of tenure-track instructors in 2016 were black, according to federal figures. The awkwardness of that encounter and others like it helped push Palmer to Howard University, an historically black institution in Washington, D.C., where he’s now an associate professor of education and on a faculty that is 58 percent black. There he joined the disproportionate number of black, tenure-track college and university instructors — one out of every five — who are clustered at 72 historically black four-year institutions that report the race of their employees. This despite the fact that those schools account for just 1.7 percent of all faculty nationwide. Meanwhile, many predominantly white four-year public and nonprofit colleges and universities that have been promising for years to improve the diversity of their teaching ranks have made almost no progress in doing so. While black students comprise about 12 percent of college and university enrollment, fewer than half that proportion of faculty are black. Fewer than 5 percent of faculty are Hispanic, compared to 16 percent of students. At the University of Washington, federal data show, 1.8 percent of tenure-track instructors in 2016 were black, while 2.7 percent were black at Arizona State University. At Brigham Young University? One-tenth of 1 percent. After racially charged demonstrations at the University of Missouri in 2015, students and professors there and at Yale, Claremont McKenna and other colleges demanded administrators improve diversity. But diversity has remained elusive, despite self-congratulatory comments from some college leaders. Shaun Harper, head of the University of Southern California’s Race and Equity Center, told a group of education journalists that one president of a large university — Harper wouldn’t say which one — bragged to him that the school had nearly doubled its number of black professors but the actual figure had merely gone from one extremely small number to a slightly larger one. Arizona State leaders declined to answer questions about faculty diversity, and Brigham Young officials did not respond to interview requests. At the University of Washington, students and professors occupied the president’s office a half century ago to protest the lack of diversity. The university now is trying to improve its hiring and retention of black professors, said Chadwick Allen, associate vice provost for faculty advancement. Like many institutions intent on boosting those numbers, it has tried to hire groups of black instructors to build a community. It can be difficult for a public university to vie for those candidates against better-funded private schools, Allen said. “If we are in a bidding war with Stanford or Johns Hopkins, that can be a challenge,” he said. But diversity scholars said schools with small percentages of black professors should be embarrassed and small improvements shouldn’t be celebrated as if they symbolize systemic change. “Getting black faculty in the door is such a minor first step,” said Ebony McGee, a Vanderbilt University associate professor of education who studies diversity in education. They also questioned the oft-cited argument by higher-education leaders that too few nonwhite potential future faculty are in the pipeline to get doctorates. Most community colleges require instructors to have only master’s degrees, said Estela Bensimon, director of USC’s Center for Urban Education, yet she said only 15 percent of faculty at California’s community colleges are Hispanic, while 44 percent of students are. Researchers have shown nonwhite students are more likely to succeed in college when they are taught by nonwhite professors. Yet black academics repeatedly encounter the same stumbling blocks when competing for teaching jobs. Despite promises to increase it, the proportion of annual faculty hires who are black declined from 6.7 percent to 6.6 percent. About 5 percent of faculty are black, compared to 12 percent of students. If a black candidate attended a southern university other than Duke or the University of North Carolina at Chapel Hill, for example, he or she is going to have trouble getting through the door at a predominantly white school elsewhere, Stewart said. But then there’s the challenge of getting a nonwhite candidate to accept a job offer. The interview process can tell a candidate a lot about a school: Was the candidate the only nonwhite person in the room? Were the walls full of photographs of white people? “It does take proactive steps,” Stewart said, noting that a black candidate may want to speak to other black professors about issues as minor as where to get a haircut or as serious about what it’s like raising a black son in the community. Hiring is just part of the problem. Black instructors often feel uncomfortable at predominantly white schools when they manage to get hired by them. Black professors say they can feel invisible or hypervisible at predominantly white schools. Often hired as “eye candy,” they’re then either overlooked or scrutinized intensely, both of which push them to look for jobs elsewhere, Vanderbilt’s McGee said. “They don’t want to stay in that toxic environment, so they leave,” said McGee, who moved to Nashville herself about seven years ago, in part because she was worried about her black son’s safety in Chicago, where she lived while working as a researcher at Northwestern University. Black professors often get called by the wrong names even after they’ve been working on a campus for a few years, said Marybeth Gasman, a University of Pennsylvania education professor who directs the Penn Center for Minority Serving Institutions. They’re asked constantly to serve on committees and to mentor black students. Then there are the “microaggressions,” as Gasman and others describe them, such as frequent comments about their appearance or their work hours. “In any work environment, if you bring someone in and they’re not treated well, they’re going to leave,” said Gasman. 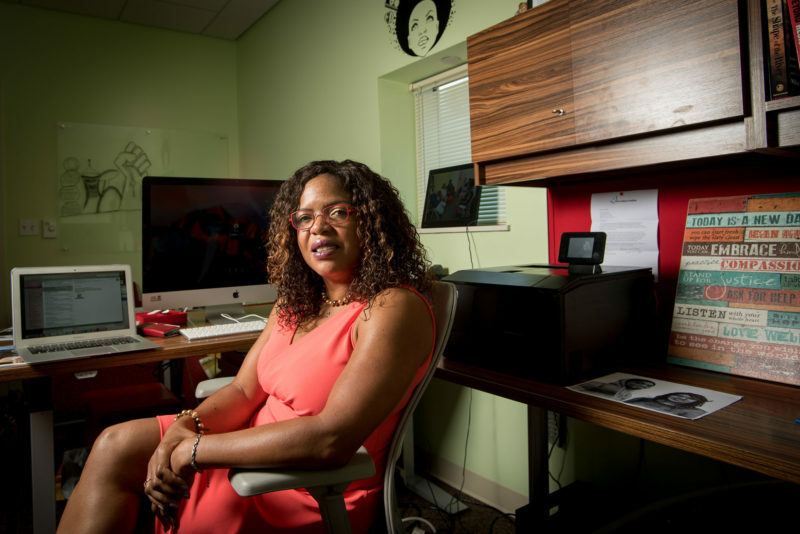 It wasn’t a toxic environment that led Kimberly Griffin, a black associate education professor at the University of Maryland, to leave Pennsylvania State University six years ago, even though just 4.3 percent of tenure-track instructors there are black, federal data show. It was the school’s relative isolation in a rural part of the state. “I think it was more the desire to live a more full and complete life,” said Griffin, who studies, among other subjects, retention of black professors. But she said universities such as Penn State could do more to make black professors feel welcome. As one of the few black teachers on campus, Griffin said she was constantly asked to do extra work on hiring committees, which made her feel like a token rather than a valued member of the faculty. Those kinds of burdens are why schools have so much trouble keeping African-American professors, she said. Black professors shouldn’t be treated as window dressing or mentors, said McGee. Data analysis by Peter D’Amato. This story about university faculty diversity was produced by The Hechinger Report, a nonprofit, independent news organization focused on inequality and innovation in education. Read more about higher education.